September 27, 2017 – The temperature of Chamber A at NASA’s Johnson Space Center in Houston has begun to rise, signaling the beginning of the end of James Webb Space Telescope’s cryogenic testing. On September 27, engineers began to warm Chamber A to bring the Webb telescope back to room temperature — the last step before the chamber’s massive, monolithic door unseals and Webb emerges in October. 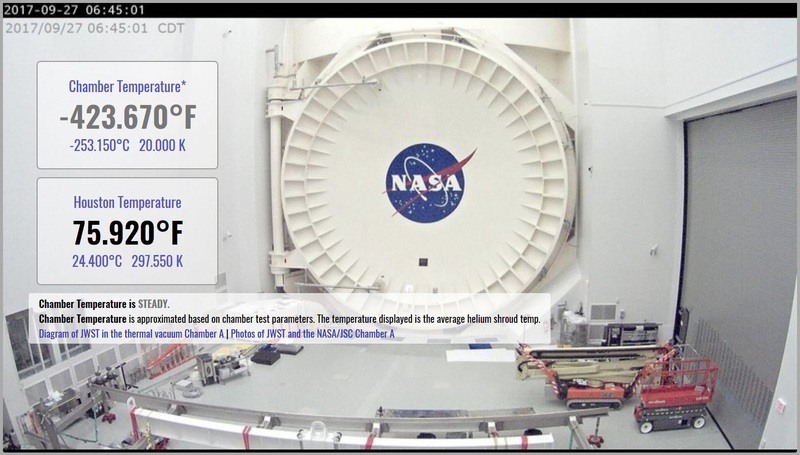 Everyone can watch the temperature ofChamber A rise during the next few weeks by checking out the temperature overlay on the online Webbcam. The overlay shows the temperature of the gaseous helium shroud, the innermost of two shrouds that were used to cool the telescope to cryogenic (extremely cold) temperatures. The two shrouds are thin, cylindrical, metal shells that envelope the telescope. Webb next journeys to Northrop Grumman in Redondo Beach, California, where it will be integrated with the spacecraft and sunshield, thus forming the completed observatory. Once there, it will undergo more tests duringwhat is called “observatory-level testing.” This testing is the last exposure to a simulated launch environment before flight and deployment testing on the whole observatory.